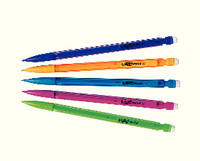 Bic Matic Grip disposable automatic pencil with 3 long lasting HB leads. Lasts up to 3 times longer than conventional pencils. Simple push button action with built in eraser. Cushioned grip for total comfort at all time. Contains 3 leads. Black barrel wit Approx Dimensions (CM): D15.5 W5.5 H2.9. Approx Weight (KG):0.0901.